Anton Tomov Slavchev, Deputy Chairman of the Committee for Combatting Corruption and the withdrawal of illegally acquired property (KPKONPI) (sic), has the authority to probe KPKONPI Chairman Plamen Georgiev, for whom Bivol revealed last week that he had not declared the full price of an apartment on three levels and a terrace. However, the question arises as to who will be then probing Anton Slavchev, who has also failed to declare the full price of apartments and a glass-paneled terrace of 244 square meters. In Slavchev’s tax declaration, it is noted that the terrace of 244 square meters costs BGN 38,000. There is no information on undivided shares. The site 19 Minutes was the first to report on the bizarrely low price of the terrace. The Property Register shows that the same terrace has been purchased at a price of BGN 216,419, but the acquisition is a joint one, not just Slavchev’s. The terrace is definitely worth the money because it is in a new building and is much more luxurious than a simple glass-paneled balcony. One can see on pictures that it has a solid roof and is fully adapted to be lived in year-round. Three apartments on the first floor of the building on 4 “Nishava” Street in Sofia’s “Hipodruma” (Racecourse, Hippodrome) district have access to the terrace. Anton Slavchev owns one of them and the other belongs to his life partner Zornitsa Atanasova Todorova. The third apartment is listed as an atelier/studio and has been bought by Anton Slavchev’s brother – Svetoslav, who has also taken part in the purchase of the terrace. 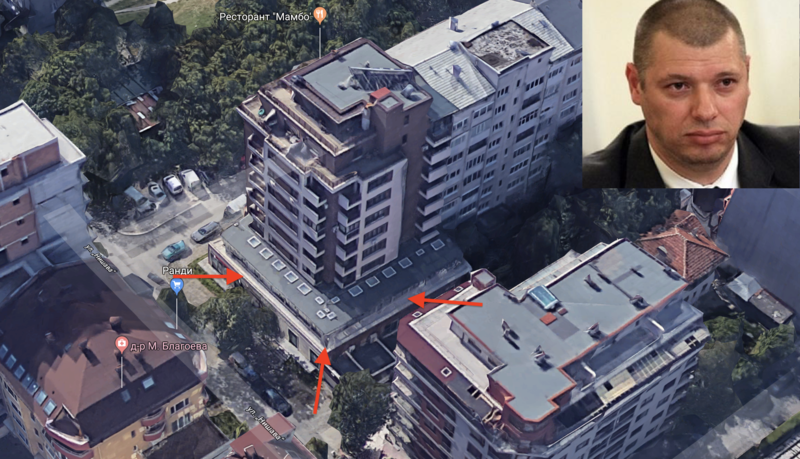 The price of Anton Slavchev’s apartment is obviously below any market value, as he has paid for 62.6 square meters and three garages (17,13 and 13 square meters), only BGN 29,251. Zornitsa has paid BGN 20,140 for 64 square meters. Thus, the average price of their dwellings is about EUR 150-160 per square meter and EUR 100 per square meter for the garages. At the time of their purchase, housing in the “Hipodruma” had been sold at prices of nearly EUR 1,000 per square to meter, according the statistics of the average sale prices in the area on a real estate site. Slavchev’s brother has paid much more – BGN 97,946 for the studio of 80 square meters or EUR 620 per square meter. Bivol does not have the title notary deed at this stage, and it is not possible to see who has bought what undivided share of the terrace, nevertheless, the family of Anton Slavchev uses it and the declared BGN 38,000 does not correspond to the value of the property. Anton Slavchev’s life partner – Zornitsa Todorova, had been for several months in 2011 the owner of the company UNIVERSAL CONSULTING & CO. As Evrokom TV reported, over the years, this company has participated in public procurement for over BGN 23 million. The company “Yuni Project” of her brother Hristo Todorov has also won plenty of public procurement, such as a project for designing water cycles with state funding of over BGN 5 million, with its largest clients being the municipalities of the northwestern city of Vratsa, the western town of Radomir and the coastal town of Nessebar.